Working in cooperation with other departments and centers, the Department for International Research and Co-operation promotes international cooperative educational projects and international comparative research with international organizations and other bodies, and is in charge of liaison and coordination with other institutes both within and outside Japan. It also undertakes a variety of international comparative surveys and studies on themes relating to governmental policy challenges at the request of the Ministry of Education, Culture, Sports, Science and Technology (MEXT). More specifically, the Department's roles are as follows: (1) to facilitate the exchange of information by hosting international seminars, in cooperation with bodies such as UNESCO and Asia-Pacific Economic Cooperation (APEC); (2) to implement, and analyze and publicize the results of, surveys including PISA conducted by the Organisation for Economic Co-operation and Development (OECD) and international comparative surveys on education conducted by bodies such as the International Association for the Evaluation of Educational Achievement (IEA), in collaboration with other departments concerned; (3) to conduct research on activities in international educational cooperation and build collaborative networks; and (4) to systematically accumulate basic data concerning policies on and directions for reform of education in countries other than Japan (including educational administration and financing, curriculum, teacher education and training, and new educational practices) and analyze the priority educational issues in each country. The products of this research have been highly acclaimed both within Japan and beyond. The seminars operated as part of educational cooperation with UNESCO had attracted more than 2,200 attendees from international organizations across more than 50 countries and regions by the end of fiscal 2006, with reports distributed at the seminars being used in many countries in the process of educational policy development. 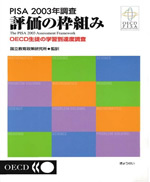 Meanwhile, the Japanese-language editions of the OECD-PISA reports are employed in developing educational policy in Japan and in discussions at the Central Council for Education and other forums. A comprehensive review is currently being undertaken concerning how Japan can best engage with international education networks. Research from now on is set to address not only international organizations such as UNESCO and the OECD, but also APEC, a body which has not received sufficient research attention in Japan to date. Each year the Department for International Research and Co-operation invites experts on education from Asia-Pacific nations to participate in seminars and workshops, hosts study seminars, and organizes a variety of other activities as part of international education cooperation to advance education across borders in cooperation with UNESCO. The Department pursues information exchange and international dialogue and has hosted an international seminar on the theme of "the contribution of education-related research to educational reform." Through its English-language newsletter, research reports, and other publications in both English and Japanese, the Department also offers updates on educational developments in Japan to parties overseas, and furnishes information on education internationally to audiences within Japan. Japan participates in the Programme for International Student Assessment (PISA), an international assessment of student academic achievement conducted by the OECD. NIER is responsible for implementing PISA in Japan, and conducts surveys of 15-year-olds once every three years across the three areas of reading comprehension, mathematical literacy, and scientific literacy. Three surveys have been conducted to date-in 2000, 2003, and 2006-and their results published throughout the world. 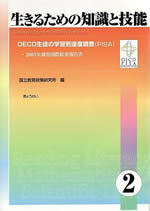 The results of the third PISA survey in 2006 were released in December 2007, with NIER taking the lead in producing a Japanese-language version of the international report (NIER, ed., Knowledge and skills for living (3)-Report on the international results of the 2006 OECD Assessment of Student Academic Achievement (PISA), Gyosei, December 2007). As well as being the Japanese representative for the PISA surveys, the Director of the Department for International Research and Co-operation functions as the chair of the PISA governing board to coordinate the survey both internationally and within Japan. A project team for the implementation of the survey has been organized across NIER's various departments and centers, and the secretariat centered on the Department for International Research and Co-operation is charged with overall responsibility for implementing the survey. NIER participates in the international comparative study conducted by the IEA on the use of information and communications technology (ICT) in education (Second Information Technology in Education Study-SITES), and in 2006 conducted a survey of lower secondary school students. The Department is also engaged in liaison and coordination of international studies in the areas of mathematics and science education. 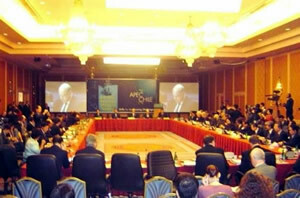 Through cooperation with MEXT, the Department participates in a range of gatherings including the APEC Human Development Meeting and the APEC Educational Network Meeting, and gathers data on education and human resource development both within and beyond the Asia-Pacific region, with the aim of contributing to the development, evaluation, and improvement of policies in related fields. 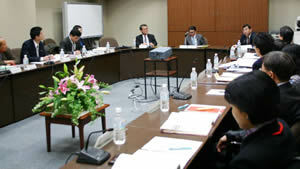 In the lead-up to Japan's participation in the 3rd APEC Education Ministers' Meeting held in Santiago, Chile, in April 2004, the Department was involved in the process of determining the feasibility in policy terms of approaches and proposals to be pursued by MEXT in the international arena. For three years starting in fiscal 2006, we are carrying out a joint basic research project in collaboration with MEXT, the Japan International Cooperation Agency (JICA), and higher education institutions to formulate policies and program development plans for international education cooperation. In the first year, literature concerning the fundamentals of international education cooperation was reviewed. In the second year, survey research was performed centering on systems for dispatch and involvement of practicing teachers in the Japan Overseas Cooperation Volunteers program, which is noted for its international education cooperation activities at the primary and secondary levels. 2006 PISA survey evaluation framework. FY 2006 Study on APEC Education Cooperation Research Report (research commissioned by MEXT in FY 2006) led by WATANABE Ryo. Knowledge and Skills for Living (3)-Report on the International Results of the 2006 OECD Programme for International Student Assessment (PISA). Current Status and Issues in Early Education in East Asia Final Report (JSPS Grant-in-Aid for Scientific Research [Scientific Research B]) led by ICHIMI (ABUMIYA) Mariko. Trends and Issues for International Education Networks-Focus on APEC (JSPS Grant-in-Aid for Scientific Research [Special Purposes]) Final Report led by WATANABE Ryo. Study of British Secondary Education Reforms-Composite Schools and Diversification Policies (JSPS Grant-in-Aid for Scientific Research [Scientific Research B]) led by SASAKI Takeshi. International Comparative Study on Publicly-financed, Privately-managed Schools: Focus on Evaluation of Public Concerns (JSPS Grant-in-Aid for Scientific Research [Scientific Research B]) Final Report led by NAGATA Yoshiyuki. Education for Sustainable Development: Asia-Pacific Region (supervision of UNESCO report translation), WATANABE Ryo. Teachers Matter: Attracting, Developing and Retaining Effective Teachers (supervision of OECD report translation), WATANABE Ryo. Education in Japan as Seen through the OECD PISA Survey-The state of education and students in Japan according to the results of the 2003 OECD PISA survey (Lecture presentation by Andreas Schleicher, Head of the Indicators and Analysis Division, Directorate for Education of the OECD), WATANABE Ryo. Educational Policy in China in the Early 21st Century-Trends and Analysis. Educational Innovation for Sustainable Development- Asia-Pacific Region Seminar Report. Study on the Education of the Children of Immigrant Laborers-Case Example of Brazilian Schools (research commissioned by MEXT in FY 2004) led by SASAKI Takeshi. Current Status and Issues in Early Education in East Asia: Collected Materials 2 (JSPS Grant-in-Aid for Scientific Research [Scientific Research B]) led by ABUMIYA (ICHIMI) Mariko. Study of British Secondary Education Reforms-Composite Schools and Diversification Policies -Interim Report (2) (JSPS Grant-in-Aid for Scientific Research [Scientific Research B]) led by SASAKI Takeshi.